A 4 part OVA released with the limited editions of the Tsubasa and xxxHOLiC volumes. There are two OVAs for each series, with plots linked together. They cover the Nihon Country Arc and scarcely some of the Celes Country Arc. 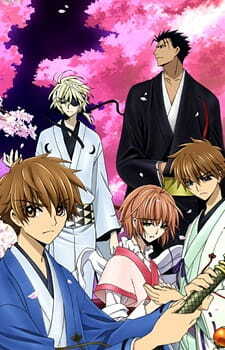 Tsubasa Chronicle: Shunraiki is the newest OVA adapted from the famous CLAMP manga Tsubasa Reservoir Chronicles. After the spectacular work done by production I.G on Tokyo Revelations I can say I was more than excited to watch this, since I am a big fan of the manga. The plot is also connected to the xxxHOLiC Shunmuki OVAs. - If you've only watched the anime versions of Tsubasa (including Tokyo Revelations) you WILL NOT understand the plot fully. - Manga knowledge is absolutely necessary to understand what is happening. - Celes and Infinity arcs were never animated (the ones who continue after Tokyo), further emphasizing my previous point. - Fai and Kurogane fans might be let down by the lack of involvement of the two during this OVA as they spend most of their time as observers. Overall Tsubasa Shunraiki can be fantastic or annoying depending on how you look at it. As a stand alone OVA adaptation of the manga, it is absolutely perfect. If you try to look at it as a continuation of the series, then unfortunately it is almost a prerequisite to have read the manga to enjoy this fully. If you are a fan of the manga then I guarantee you will not be let down by this, if you have only experience Tsubasa as an anime then I would STRONGLY suggest you read it before trying to watch this, it would greatly decrease the enjoyment factor. :::The artwork is precise and even if there are only two episodes, you can see the difference in it between the two seasons of Tsubasa Chronicle and the OVAs. :::The soundtrack is awesome as always and the op and the ending are very nice. :::The characters are the same for all of you who have watched Tsubasa, but /especially if you are reading the manga/ you can see them more serious and everyone of them with his personal story in the shadows. Tsubasa Spring thunder is CLAMP's latest installment of their ever ongoing Tsubasa/HOLIC project. Following the exceptional work that was "Tokyo Revelations" even I was beginning to think I.G was the better choice for handling future Tsubasa projects. With the announcement of Spring Thunder it was no surprise the various CLAMP fanatics began jumping for joy and same with some of the fans such as me. Now after watching both episodes, I have to say, this was a real let down. Tsubasa Spring Thunder is the bad example of what happens when the original creator of the source material comes to write in the adaption. Nanase Ohkawa (aka Ageha Ohkawa) the principal writer of CLAMP, whom I've found to have exceptional screenwriting talent handled this script for this as well as "Tokyo", having taken over from the TV series writer Hiroyuki Kawasaki. Ohkawa crafted Tokyo so well, I would have handed her the Academy Award for Best Screenwriting of the year. In the case of Spring Thunder I would easily hand her a Razzie award for the Worst. Ohkawa proves that she and her fellow CLAMP mates are too married to their story that all they can do is tell an animated version of their manga, basically wasting everyone elses time. Spring Thunder proves to be nothing more than a carrot for the loyal fans who have kept reading through the years while basically saying "piss off" to those who have only followed the anime installments. Having only partially read the manga I was beyond confused. As Spring Thunder doesn't immediately pick up where Tokyo left off. Production I.G's motto is, " to make anime that stands on its own ground without being an extension of manga." And to me I.G completely threw that motto out the window. The film is cluttered with to many flashbacks to events we haven't seen and likely never will, and it only leaves the viewer with a real sense of emptiness and endless plotholes that they won't be able to fill unless they claw their way through god knows how many books there are now. At the very least Ohkawa was still able to make a somewhat-coherent screen story that I could follow at the very least. Still most of the time I was hopelessly lost with no hope of ever returning. It seems the plot of Tsubasa has dissolved to a very epic and thoroughly thought out quest to just mind-bending improv from CLAMP. Equally disappointing was Shunsuke Tada's direction. Tada used way to many cuts and hardly got creative, except with the action scenes. Too often than not we are cut into long and pointless exposition scenes that some of us really just don't care about. I found my self fast forwarding through this more than on the edge of my seat with anticipation of what the next scene holds. And of course Tada follow the old animation creed of "animation first, music second." Yuki Kajiura's score is ridiculously forced into the background to the point you even wonder if there is any. Rather than use music to heighten the scene and emotion, Tada makes it feel like it's just playing on a radio, as basic white noise. I said this in my review for Tokyo, that the use of music is the thing I find much more appealing about Koichi Mashimo at Bee Train compared to anyone else, and this only proves my point. On the one plus side was he finally decided to use more variety of pieces from the Tsubasa OST archives than he did in Tokyo and we were able to get a few new pieces from Yuki, who is understandably busy with a variety of projects. Yoko Kikuchi character designs while not dreadful aren't exactly appealing. That being said I do prefer Bee Train's designer Minako Shiba. The art style is a slab of strangely clashing color pallets dull pastel colors mixed in with dark blacks. It's almost as though Tada can't settle on any style. Tomoyo is equally unappealing in her design as she looks like she's wearing football gear under her robes. There is no continuity to the visual style of this. It's bright and flowery yet strangely dark, almost filmed like a dark comedy. The opening animation is just beyond obscure and doesn't set the mood appropriately for this short OAD series. While Maaya Sakamoto is probably one of the best singers from Japan I've ever heard, her themes never seem to ever to match appropriately to anything Tsubasa. Kajiura however has always mastered the theme songs as her ending has fitted a lot more. It's great to hear FictionJunction YUUKA perform yet again. The overall animation quality is still very well done for this short production and I didn't notice any real problems with the animation. The fight scenes were well crafted and well animated which made for some great footage. If anything else saved this from being the worst video production I've seen of all time it was the animation as well as the all star acting from the cast. Miyu Irino has come a long way as an actor, and gives the performance of a life-time for this. The other cast-members also have given it an all star performance and continue to improve as actors. Spring Thunder isn't bad or terrible. It's simply average, boiler plate, run of the mill. It was CLAMP's little present to their die-hard fans, and leaves anime fans in the dark. It's now very clear as to why this little production is only being sold with the manga instead of a wide release on DVD as opposed to CLAMP's other productions. It makes me think they should give it back to Mashimo and just make another season, or at least maybe go to the movie director Itsuro Kawasaki. First off, know that I'm writing this review without reading the manga. But I've watched the two Tsubasa Chronicle series as well as the Tokyo Revelations. As others have mentioned, This OVA is far off from what the anime series has been leading to so far. But if you watched Tokyo Revelations, things make sense. Art (10/10)The art is awesome. You can expect CLAMP at its best, always. There's no more of those 15 second focus shots. Also the dimensional/magical effects are superb. Sound (10/10) The sound has ALWAYS been awesome. If you watched the Tsubasa Chronicle series, you know how awesome it is already. There are no insert songs, and I find that well put, because they would only slow down the epicness. Charcater(8/10) like i said already, there are many more connections between the characters than there has ever been. Sakura's character develops about 100 fold in my opinion. I only gave this an 8 because there are some manga background of Fai that I'm missing, which made feel like I was missing something. But with some wiki, that soon disappeared. Like I said even without the manga, things will make sense for the most part. Enjoyment (10/10) I'm usually a lurker within MANY MANY anime communities, but this OVA was SO EPIC that I just HAD to write a review. It's that awesome to me. Overall (10/10)....... in the words of Jay-Z: "What more can I say?"